Can't get your head around starting your own website? Powerful Website Builder On The Market! Thousands of satisfied customers all agree! 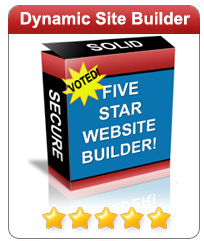 Dynamic Site Builder is truly exceptional, which is why it's so popular. It's technology is so far ahead of the competition that it's easier to use than any other site builder! More time is spent making Dynamic Site Builder easy to use than on any other feature. The most relevant help document is always just one click away. The easy editor works just like your favorite word processor. Hosted on a carrier-class server with back-up power supplies and back-up air conditioning which ensures 99% uptime. Create great-looking websites! Over 1600 website templates to choose from.